On the opening track on Band of Horses fourth record, Ben Bridwell rides above the clanging guitars and sings of a ‘Ramshackle crew with something to prove’. After the mixed reactions to their last release (2010’s Infinite Arms- their first release on a major label), it’s a fairly true statement for the Seattle band, who this time teamed up with mega producer Glyn Jones (The Rolling Stones, Bob Dylan) to craft their fourth record. Mirage Rock is BoH at their most refined- big slabs of riffs and ringing cymbals rub shoulders with pedal steel ballads, commanded by Bridwells earnest nasal twang. Lead single “Knock Knock” races towards a big finish of crashing drums and harmonies, and is Mirage Rock‘s biggest moment. In their quieter moments, on tracks like “Slow Cruel Hands of Time” and “Long Vows”, BoH trade chanting harmonies over spindles of guitar and organ. Jones’ influence also shines through on “Electric Music”, which plays like an homage to the Stones mid seventies. 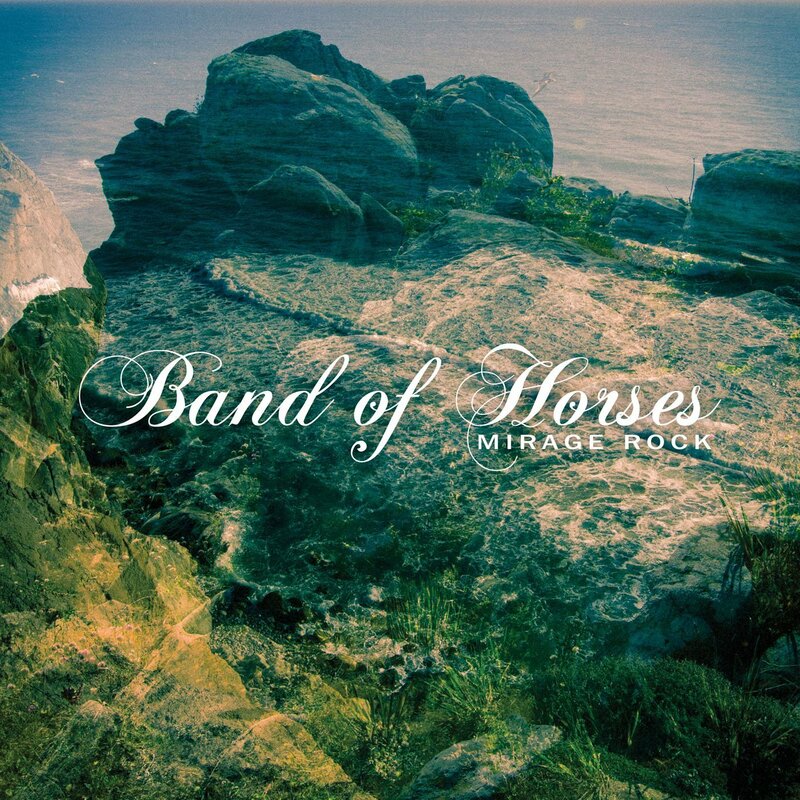 At times ringing with Americana (“Everything’s Gonna Be Undone”), before falling into dreamy rock (“Feud”),the sound is unmistakably Band of Horses, distilled to a single malt. It may lack a big, defining track of previous albums (“Is There A Ghost” of 2007’s Cease To Begin) but Mirage Rock is Bridwell and his crew at their fullest and finest. This entry was posted in Album Reviews, Music and tagged album, art, Band of Horses, cease to begin, entertainment, knock knock, laredo, mirage rock, music, reivews by Jules LeFevre. Bookmark the permalink. Just that album cover alone is enough to make me buy the album! Thank you for sharing this with us. I know! The album cover is beautiful.